Fleeting expressions and gestures can be more revealing than static poses, which is why candid snapshots are often valued more than formal portraits. Yet snapshots of cancer are few and far between. Cancer, in its earliest stages, is unusually camera-shy, biochemically speaking. When cancer originates in DNA repair mechanisms that turn awry, tell-tale DNA repair intermediates disappear quickly, eluding capture by ordinary means and frustrating would-be scientific paparazzi. To take the most candid images of cancer’s origins, scientists based at Rice University and the Baylor College of Medicine decided to exploit synthetic biology. They engineered proteins capable of capturing short-lived intermediates of DNA repair. Between the original, damaged DNA and the final, repaired product, cells produce DNA reaction intermediates, which are crucial to DNA repair but are difficult to study because they are present for just a fraction of a second as an enzyme catalyzes the changing of one molecule into another. Dr. Rosenberg led a study (“Holliday Junction Trap Shows How Cells Use Recombination and a Junction-Guardian Role of RecQ Helicase”) that appeared November 18 in the journal Science Advances. 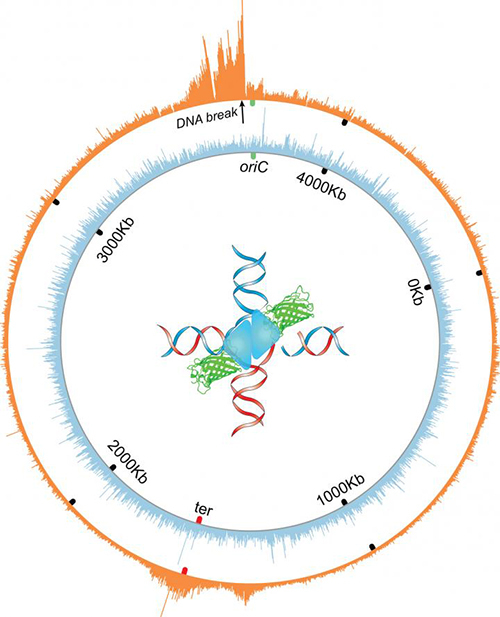 In this study, engineered proteins were used to trap, map, and quantify Holliday junctions (HJs), a central DNA intermediate in a DNA repair mechanism called homologous recombination (HR). The engineered proteins were based on catalytically deficient mutant RuvC protein of Escherichia coli. In their tests, Rosenberg and colleagues found they could discover molecular mechanisms underlying genome instability, a hallmark of cancer. In one instance, they discovered a new role for a protein that is related to five human cancer proteins. Rosenberg and colleagues think that their approach offers significant advantages. For instance, with the synthetic proteins, they have been able to identify specific DNA-repair intermediate molecules, their numbers in cells, rates of formation, and locations in the genome and the molecular reactions in which they participate.